That day has finally arrived. Indeed, today is the first day of spring and we can sense the excitement in the air. It has been a long and rough winter for many of you and most of us are ready to welcome warmer weather, longer days and boating activities. Boaters from all over the country are eager for some warm-weather fun and the first day of spring marks another boating season. But before you hitch up the trailer and prepare yourself for another year of what will surely be great boating experiences, you have to take care of business. You need to prepare your boat for another season of fun and adventure. When the lake is calling your name, you want to ensure that your boat is ready to go. 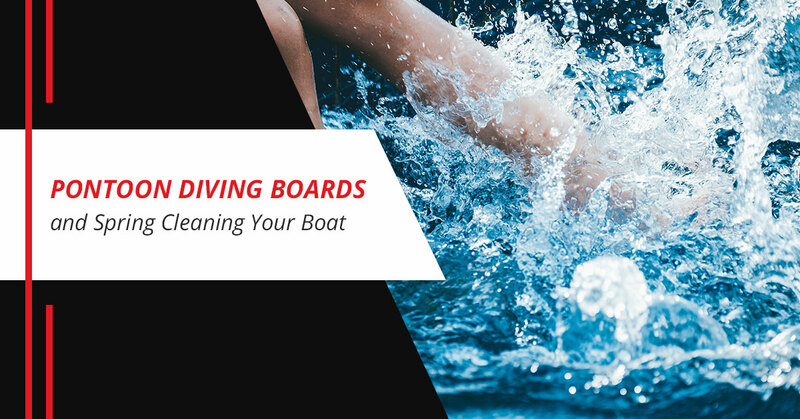 Lillipad Marine, your source for pontoon diving boards, offers tips for preparing and cleaning your boat for spring. We recommend that you use an environmentally friendly soap to clean your boat. This is for obvious reasons. You also want to avoid soaps and detergents that are so powerful they can strip away or otherwise damage the finish on your boat when used over the years. Also, we appreciate your commitment to keeping the environment free from dangerous products. Before you dive in and start scrubbing your boat from top to bottom, give your whole boat a good rinse. You do this because much of the caked-on dirt on your boat will come off by simply rinsing it off. There is no need to scrub chunks of mud and other debris that will just rinse off. Over time, all of that scrubbing will take a toll on your boat’s finish. So it is a good idea to rinse off what you can before applying the elbow grease. You could use a garden hose and a bucket to clean your boat, but you will be spending way more time on this task than necessary. Try to get your hands on a power washer to clean your boat, it will do a much better job in a fraction of the time it takes to manually wash your boat. In addition, you won’t be as worn out, tired and sore at the end of the day. A power washer will also allow you to get into all of the nooks and crannies on your boat that you simply can’t reach. A boat cleaned with a power washer is far cleaner than a boat scrubbed down by hand. Let the stains, dirt and debris that doesn’t come off while rinsing soak for awhile before scrubbing it off. Let the water and detergent soak into the dirt and soften it up to make it easier to remove and to lessen the chances of scratching or otherwise damaging the finish. If left unchecked, any part of your boat made from canvas can form mold and mildew. It is suggested that you clean the canvas parts of your boat with warm water and dish detergent. Follow this up with a good rinsing. Once the canvass parts of the boat are cleaned, let them dry thoroughly in the air. A simple mix of water and detergentcan be used to clean your engine. Engines get dirty you know and your boat is not completely clean until the engine is spotless and shines. If you run into some tough spots, you might have to break out a tough degreaser. Vinyl is designed for water-filled environments. But this does not mean that it won’t look better and last longer if you clean it on a regular basis. All you need is mild soap, water and a bit of elbow grease to clean the vinyl parts of your boat. It is also recommended that you add a UV protectant to any vinyl exposed to the sun. A coat of wax will help keep your boat looking shiny and new throughout the season. Using a circular motion, apply the wax to the hull of your boat. Once it has dried, remove any excess with a soft towel. You should also wash down your diving board. And if you don’t have a diving board, shop for one at Lillipad Marine.